As some of you may have noticed, thinktheology.org hasn’t been very active this past week. For my part, I’ve been busy with a variety of things related to my education, pastoral service, and involvement in the Vineyard Movement (I’m at a leaders retreat). Yet something bigger and far more difficult has been going on in the life of my good friend Kenny Burchard. Kenny is a blogging machine, so it’s realistic to say that when he’s not blogging, thinktheology.org slows down, right Able? LG – Kenny, our blog has been kind of silent this week. Could you share with our readers what has been going on in your life the past few days? KB – Well, on Saturday morning my phone rang at 7:30 am. My brother’s caller ID popped up, and I immediately knew something was up. My brother texts me about three times a year, so when he calls, it means something’s wrong. I knew instantly that he was calling about my dad. 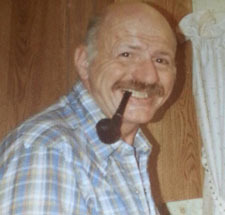 My dad was just a few weeks shy of celebrating his seventy-sixth birthday, and on Saturday morning he suffered a heart attack at home and died that morning. He wan’t in great health, and to be honest, I had been wondering when I’d get that call – but I wasn’t ready for it. It wrecked me to lose him. I really love my dad. It might sound weird, but now that he’s gone, I realize I loved him more than I had even known when he was still here. AB – Kenny how did God, family, church etc help you come to grips with the shock of the overwhelming emotion involved in the loss of your father? KB – That’s a huge question. I’d say that just knowing the love of God, his care for me, and his presence is something that I just can’t imagine living without. I grieve for people who try to live in the world without the sure knowledge of God or the care of a loving church family. Our church family has been amazing. Two of our Elders prayed and wept with me on the phone within an hour of finding out that my dad had died, and another one of them came to my home later that evening and just listened and cried with me as I talked about my dad. The church family was incredibly supportive of me and my whole family in ways we’ll never forget. My mom was particularly blown away by the care and generosity of our church family — and especially our church council. Facing grief and death without a church family is simply unthinkable to me at this stage of my life. I don’t advise it. LG – One of your recent blogs was related to pastors taking care of themselves. How have you been caring for your soul? KB – Yeah, that’s a good question. A few things come to mind. First, I just let myself feel, and I don’t try to modify my emotions or my emotional expressions for the sake of diplomacy. In my case, there have been a lot of tears, and I just let them flow. I also shared with a couple of the elders in our church on the day that my dad died how sad I was, and I just cried with them (and they cried with me too!). I also spent a lot of time in my dad’s room as soon as I flew home. I wanted to be in his space, smelling his clothes -which might sound weird, and just being in the spot where he hung out. I wanted to have as much of him as I could have since I couldn’t actually have him. Of course, I have been praying for God’s peace and comfort, and reflecting on God’s faithfulness, but the way I’ve been most comforted is by being with people who love my dad, and celebrating his life, and mourning his death without apology. AB – Can you better identify with some of the anger and blame involved in the response of those mourning the death of Lazarus*? If so, how? *John 11:31–33 (The Message)31 When her sympathizing Jewish friends saw Mary run off, they followed her, thinking she was on her way to the tomb to weep there. 32 Mary came to where Jesus was waiting and fell at his feet, saying, “Master, if only you had been here, my brother would not have died.” 33 When Jesus saw her sobbing and the Jews with her sobbing, a deep anger welled up within him. KB – I honestly don’t feel any anger or blame toward God with respect to my dad. But I can remember a time about twenty years ago when I was trying to witness to my dad and he just didn’t seem open at all. I got in my car and went for a drive and just started weeping because I wanted my dad to know about Jesus like I knew him, and he seemed closed. I remember pounding on my steering wheel and saying, “Why, why why? !” and crying for about ten minutes. But then I just stopped and felt God’s peace — like he was telling me to leave it all to him and not try to make anything happen. From that point forward, I have just tried to trust God with my dad — though I never saw him respond to faith like I hoped he would. However, I do feel some anger and resentment, but it’s not toward God. It’s toward death. I think it’s what Jesus felt, if I can share my personal belief about Jesus’ anger in that text. I believe that Jesus hated death. He hated sin and the devastation that it unleashes on people. When his friend died, his anger was directed at what Paul later called the “enemy, death” — which will ultimately be destroyed. Now that I have lost my dad, I hate death more than ever. But I also rejoice in Jesus’ message and promise of resurrection. LG – What is the most important lesson you learned from your father? KB – I have thought a lot about this. My mom and dad adopted me when I was eight moths old, and when my younger brother was born (to my parents) I began doubting that my dad loved me as much as he loved my brother. I would accuse him of not loving me as much when we were kids, and he always told me I was wrong, and that he never thought of me as being less than his own son. I could never quite believe it. Nine years ago my wife and I adopted our son Victor from Ukraine (our first and only son), and my parents drove out to spend a couple of weeks with us and to meet our son. I invited my dad to join us in the back yard while I showed him the new swing set, so he came back with me. I was pushing my son on the swing and making small talk with my dad, and he just walked over to me, took his pipe out of his mouth, put his arm around my neck and looked me in the eye. He asked, “So son, do you understand now?” and his eyes filled with tears — and so did mine. I just hugged him and said, “Yes I do. I really do.” Then he put his pipe back in his mouth and looked down while I kept pushing my son on the swing. We never talked about it again, but I knew what he was saying. He was telling me that the love I felt for my son was the same love he felt for me. So, what I learned from my dad was the love of a father, and it is one of the most powerful things I have ever felt for another person. To know my dad felt that for me is a gift I’ll never forget. AB – How is God helping you through the “If only I would have________” questions? KB – Well, first I will say that I do have some of those “if only” questions. I wish I had seen my dad in person one last time. I wish I had been able to talk to him about his faith one more time. I wish I could have been closer to him toward the end of his life. I wish I would have called him on the phone once more. I actually thought about it between my last call and the day I found out that he died, and it was the first thought I had. I was so mad at myself. But the way God is helping me is by reminding me of my last conversation with him just two weeks before he died. I had sent him some gifts in the mail, and he called me later in the day to SKYPE with me and show me that he had received them. We were laughing together and he was telling his dumb “old man jokes” and it was great. The greatest comfort to me in all of this is that my final words to my dad during his life were, “Okay dad. I love you,” and his final words to me were “Okay guy, I love you too.” My dads voice cracked with emotion every time he told me that he loved me, and that time was no different. Having that memory of my dad is such a comfort in the midst of all the things I could regret — but I choose not to dwell on those because neither my heavenly father nor my earthly father would want me to. LG – How has this situation influenced your biblical, theological, and practical theology? KB – Well, this can be uncomfortable for some people, but again, it’s something I have thought a lot about. At the risk of causing anyone concern, I’ll just say where I’m at right now and let the readers draw their own conclusions. The bottom line is that I am sad that I lost my dad, and I am sad that I don’t think he ever accepted Christ. Because of that, I am sad that I may never see my dad again. But a few years ago I began digging into the writings of Ed Fudge as he developed his theological understanding of the biblical teaching on what happens to us if we die outside of Christ. Fudge believes, and I agree with him — that the teaching of scriptures is that the human soul is conditionally immortal, and not unconditionally immortal as the Greek philosophers believed. God alone possesses immortality, and the soul that sins dies (1 Tim. 6:16, Ezekiel 18:20). And so, biblically speaking, immortality is something that comes through a relationship with God in Christ. I can’t really develop it all the way here, but essentially – since you asked about biblical theology, my conviction is that my dad’s story has come to a close, and will not move forward beyond his mortal life with the eternal story of scripture. For my dad, there is no more story beyond the memories that I have of him, and the example he set for me — and those are powerful things. But my conviction is also that unless he received Christ, his soul was not immortal. Rather than having eternal life, he had a temporary life. So, though I grieve that unless my dad accepted Christ he does not have eternal life, I do not grieve fearing that he is somehow being tormented somewhere forever. I have thought about Jesus’ teaching on hell more than most people I know, so I don’t need any reminders about verses I simply must be ignoring. I know them all, and I have preached on them myself. But I am convinced that we have not thought about what Jesus was telling us as carefully as we should have. I don’t think the story of the possibility of eternal conscious torment is the story the Bible is trying to tell us about those who perish apart from Christ, and my conviction about it is only strengthened as I have thought about the death of my father. He didn’t join the story that lasts forever that I know of, but I take comfort in what I have learned and embraced in Ed Fudge’s work (and others), and I encourage other followers of Jesus to think about his conclusions too. But you’ll have to read his stuff if you want to fill in the gaps that my answers may have left here. I really hope the readers will at least take the hour to watch Fudge’s lecture linked here. Though I am pained that I lost my dad, and that he never accepted Christ that I know of, his death has given me an opportunity to think about these weighty questions “in the trenches” – as we like to think about things here. AB – I have experienced sadness and regret as dimensions of depression. Are you dealing with depression from any other sources other than sadness and regret? What helps you through? KB – I have felt a lot of sadness, and a lot of waves of sorrow and crying. I’m not sure I have felt depression. I’d say four things help me through my sorrow. First, if I’m sad and I feel like crying, I cry. I don’t care who hears or sees me cry, and I’m not afraid of what anyone would think of me. It’s a sad and grievous thing to lose your dad, and crying is good. Talking about my memories of my dad also help me because eventually, I end of thinking of some crazy thing he said or did that makes me laugh, and that brings me joy! Being with people who knew and loved my dad helps too. As we cry, laugh, talk, and just sit together, it’s like my dad is with us in those moments of remembering, and there is a peace that comes with that. The last thing, for me, has been looking at pictures of my dad and remembering what he meant to me and what I learned from him. My dad’s influence on my life — as I am thinking about it — was way bigger than I had ever really thought about until he wasn’t there any more. His memory is a huge source of comfort to me. AB – What are you finding the most difficult to accept about this whole experience? KB – For me, the most difficult thing is that I don’t get to talk to my dad anymore. He was like a rock in our family, and it’s just weird that the world goes on and he’s not here. LG – How can we pray for you through this time? KB – Pray especially for my mom and my siblings. Sometimes the death of a person that we love can make us pay closer attention to our own mortality. Pray for my family to be open to the work of the Holy Spirit. Pray that they will open their hearts to Christ and join the story that lasts forever. That has been my passionate prayer since I accepted Christ myself in 1986. I don’t want the end of their temporary life to be the end of our relationship. Outside of Christ, this life is all we’ll have with each other. As great as that is, I want more! I love my family. Thank Kenny for sharing your journey. May the King of Kings continue hold you and your family tight as you walk this path. Very sorry for your loss. I’m not ready to lose my dad either.